One of the things Israel lacks is Mexican and Tex-Mex food. We have plenty of ethnic food here, as I’ve noted before, but it tends to be from different ethnicities, those with more of a presence here. And we don’t have many Mexicans. Anyway, it’s still lime season, so stock up. Next up is chipotle, which as I’ve mentioned, is somewhat of a trend. Katherine and I were pleased to note that East West stocks cans of chipotle en adobo — that warm, fiery red sauce of smoked chilis with such a distinct flavor. Cilantro is ever-present at every greengrocer’s stall. And if you want to make your own corn tortillas, you can even find masa de harina at a hidden little south American store in the Carmel Market called Achim Kahlani, as Ben discovered. Unusual ingredients are kind of like toys if you ask me. Since my reference base is Mediterranean and Middle Eastern, a smoky, fire-roasted eggplant seemed like the perfect foil for the smoky, roasted chipotle en adobo now stored safely in my freezer. This traditional dish underwent a mild conversion in order to come out Tex-Mex style, with lime standing in for the usual lemon juice, cilantro replacing the parsley, and of course, chipotle kicking the whole thing up a notch. The quantities below make more tahini than you likely will need for one eggplant, but for me that’s OK — I like using this as a sauce in sandwiches. Final notes: You can make your own chipotle en adobo if buying it ready-made isn’t an option (availability, kashrut standards, etc.). Here’s one recipe for chipotle en adobo, though I haven’t personally tried it. Also: I have another recipe for chipotle tahini, one that uses powdered chipotle instead of chipotle en adobo. It probably would work here, too. Mix all the sauce ingredients together. You can use more or less than the recommended quantity of chipotle, depending how much spice you like. Slice the eggplant open at the base and put it into a metal strainer so the liquids can drain out. Once it is cool enough to handle, peel off the charred skin. I often do so under the faucet, since this helps remove flakes, but some people say this removes some of the smoky flavor. Either way, if you use running water, you’ll need to let the eggplant drain again. 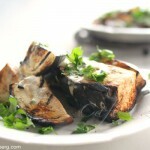 Slice the eggplant open fully, arrange on a plate, drizzle with tahini and top with chopped cilantro. 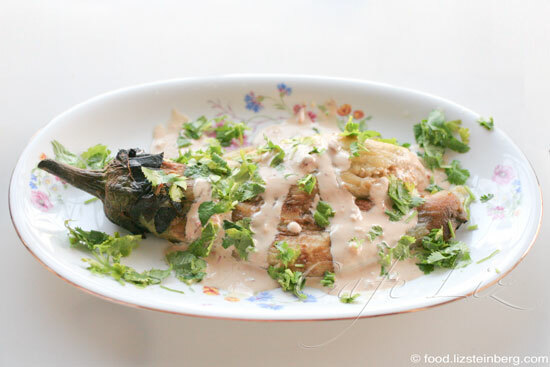 10 Responses to "Flame-roasted eggplant with chipotle-lime tahini"
Forgot to mention that the price for a kilo of masa harina in Helsinki (which is a very expensive city) was a mere 2 euros…. I’m surprised that you don’t have limes in Israel. Actually I thought that dried limes (I think there referred to as loomi – although I can’t remember what language that word is) is used in middle eastern cooking. Also I’m always surprised to read from Israeli food bloggers how new types of food have been released to sell in Israel, I guess because there have been a lot of Jewish people from different countries that have made aliyah. Also I have a question about Tahini. Which tahini do you usually use hulled tahini or unhulled tahini? What is the difference between these different types of tahini? Thank you so much Liz! Hi Debbie, we do indeed have loomi (called Persian lemons here, used in Persian cooking) but they’re not necessarily produced locally. And in general, it takes new and international foods longer to get here than to somewhere like the U.S. — true for things other than food, too. 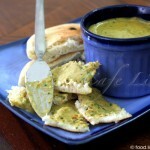 And: I use hulled tahini, mostly because that’s what’s most common here. I’ve never worked with unhulled tahini, so aside from all the nutritional differences, I don’t know what it would be like in terms of cooking. Thank you Liz for your comments about loomi and tahini. I just checked my supplies of tahini and I also use hulled tahini. Here in Melbourne Australia they are so unhulled tahini but from my experience although taste wise it is the same, it is a deeper beige color and is extremely more difficult to work with because it is like getting clay out of a jar. The reason being is because from my basic understanding unhulled means the sesame seed shell was left on in the process of making the tahini therefore making it more thicker and firmer to use than the creamier version of the hulled tahini in which the shell of the sesame seed was discarded in the process of making the tahini. It is good to know that in Israel hulled is more readily available. Love love love this Mexican-Mediterranean fusion! And that story about the limes is too funny. 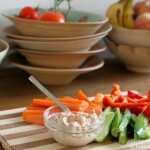 Hey Meg, check out the comments on this post, onion-chipotle tahini dip — chipotles are indeed hard to come by, but here are lots of suggestions!